April 11, 2012 / P.J. 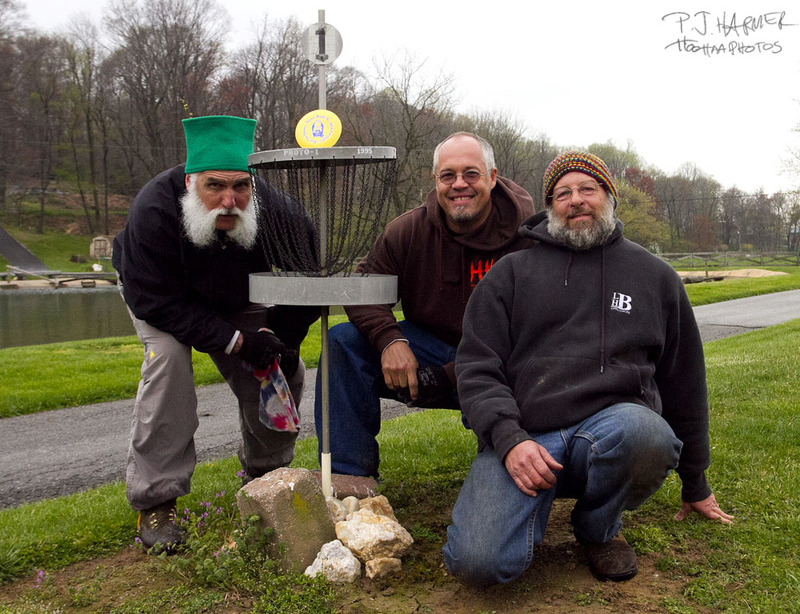 Three of the original members of the MDGF — from left, Merrill Detweiler, Linc Morgan and Donnie Brooks, pose next to Brooks’ original prototype mini basket at his course near Lancaster, Pa.
Nestled within the beautiful surroundings of Amish Country in Lancaster, Pa., is a virtual disc golf paradise. The paradise differs a bit, however, from what many might think about when it comes to a disc golf haven. This is on a smaller scale. In fact, you could call it a mini paradise. It’s almost shocking to know what’s in this area — nearly a dozen mini disc golf courses. It’s the home of the Mini Disc Golf Federation, a tight-knit group that works to spread the word of mini disc golf — a sport like the “bigger” version with a few rule changes to help with the smaller scale of the game. For many, the mini discs they see or use are for one thing — marking their lies during a round of big disc golf. But these discs — many of them, anyway — can be thrown. Sometimes, quite a distance, too. It’s rumored some minis have been thrown upward of 400 feet. Mini baskets and courses can be put in small areas, including residential areas — such as this basket at Starry Stompin’ Grounds outside of Lancaster. A visit to the Lancaster County area can show you how creative and different mini disc golf is. Morgan plays both mini and big disc golf — at high levels. The second member of the MDGF (.00002), Morgan is also an earlier member of the PDGA (7518) and is a pro player with a 986 rating. Created in 2004, the MDGF has slowly started to grow. There are nearly 100 members who have paid to become part of the group. The rules are few, but there is one big one, Brooks said. There are some notable members of the MDGF, too. Avery Jenkins, the 2009 PDGA World Champion is member No. .0033. Dave Feldberg, the 2008 PDGA World Champion is member .0049. Andrew “Big Dog” Sweeton, the PDGA Tour Director, is member .0036. 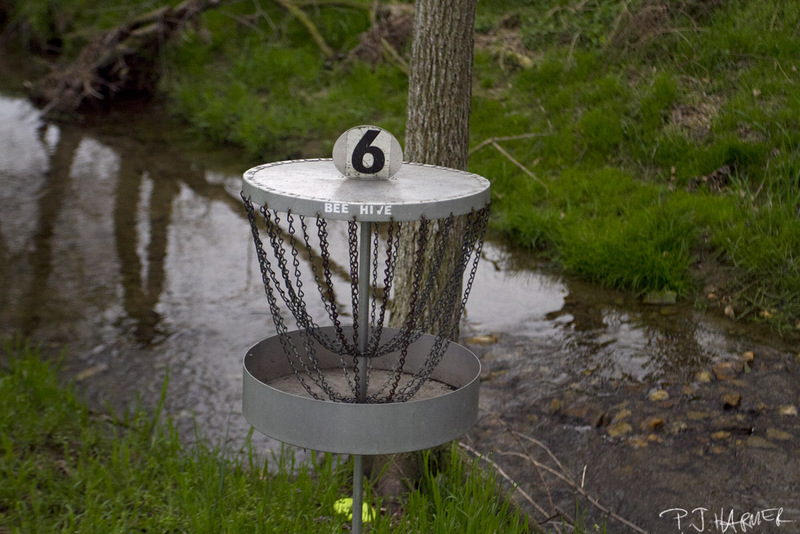 Many of the rules the MDGF uses are that of the PDGA rules. There are exceptions, however. The biggest might be the no run-up rule, which has been discussed a bit among members. Some seem to think the run-up should be allowed, others don’t. As with many rules, there will always be two sides of the argument. The other major difference is when a mini lands on top of the basket, it’s counted as good. In regular disc golf, that’s not a made basket. Holes can’t be longer than 400 feet. The 2-meter rule isn’t in effect. Out-of-bounds rules can differ course by course — and many times you throw from that spot and just add a stroke. As for the discs, all minis 4.5 inches or smaller in diameter are approved for play. Wood and metal discs are not allowed. Brooks said the history of mini disc golf could be a little sketchy. He said he once spoke with Dr. Stancil Johnson — a noted Frisbee historian — who told Brooks when Wham-O came out with a mini disc, people often used them in work settings, flipping them from office to office into trash cans. That might be the start of mini disc golf. Brooks said that was probably in California, a long way from Lancaster, Pa. Playing Brooks’ course in Lancaster County Pa., can give you a history lesson as some of his earliest baskets are in play. The first course in the Lancaster area arrived in the early 1980s. Since then, the area has expanded and there are 11 courses dotted throughout the area and Amish country. Of those 11, six are “public,” with one of those being truly public. The others ask for people to call ahead to get tee times or to make sure the course is available. “I got hooked on the game and wanted to duplicate the game,” Brooks said. Those are the discs noted on the MDGF website. Vibram also has some minis that can really get some distance and fit the size of a legal mini. 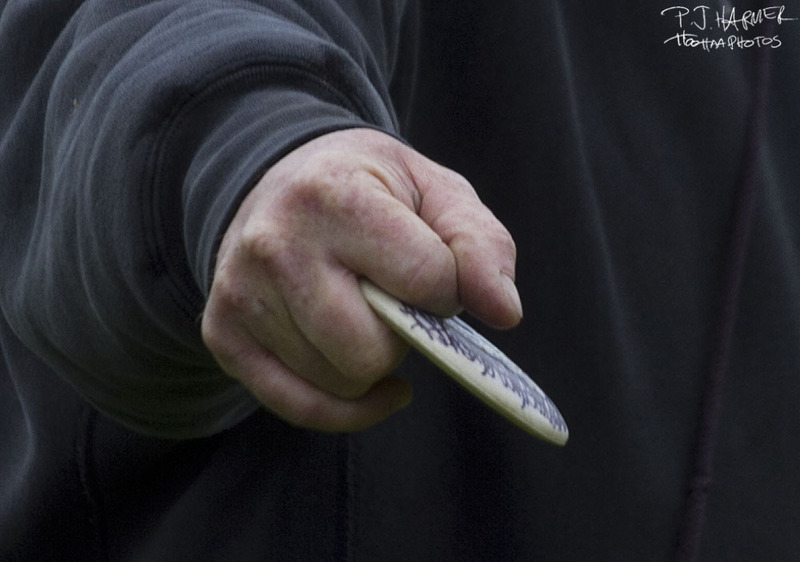 As with normal disc golf, players will carry several discs that do different things. Just because the discs are small doesn’t mean they don’t do different things. The grips for throwing mini discs can differ. Mini disc golf bags are used by some as well, but they obviously aren’t as big as regular disc golf. Throwing can be slightly different, too. Some players throw the minis as a normal disc, others have their hands and fingers positioned differently. Some hold the disc between their pointer and middle finger. Brooks started building baskets in the 1990s. His first basket came in 1995. He did the work in his basement. That has since progressed and he works on the SS (Stainless Steel) MiDGiT baskets, which he started building in 2004. The MDGF was formed in 2004 and since then, Brooks said mini disc golf has slowly progressed and gotten bigger. “As people started playing it, they wanted to duplicate it in their yards as well,” Brooks said. There are some mass-produced mini baskets as well. Innova, DGA and Wham-O all have available mini baskets. There are also others who make the baskets. The chains don’t “sing” as much as they do in regular disc golf, but it’s still the same feel to watch the smaller disc hit the chains and drop in the basket. Amish country is quite breath-taking. Rolling green fields, well-kept farms and nature at its finest. Unlike big disc golf courses, however, mini courses don’t take up a lot of room. So these little gems are in residential areas, for the most part. You might be driving through a neighborhood and see a couple of baskets popping up on the side of the road. 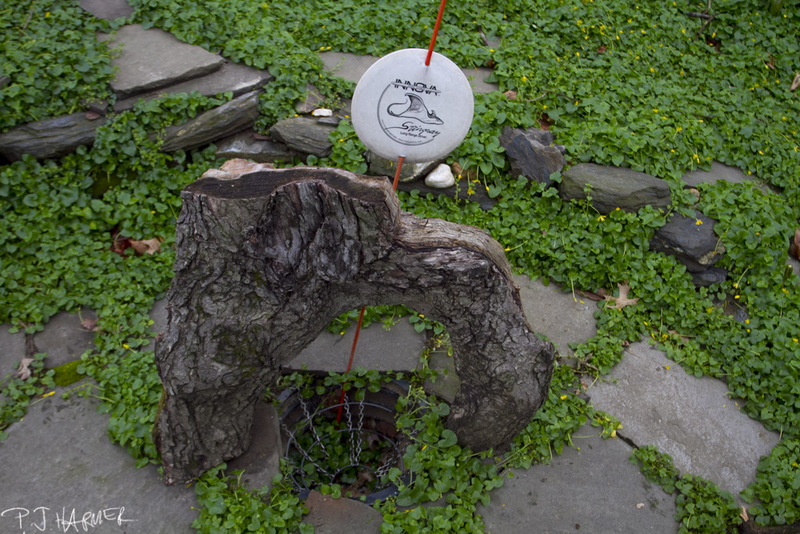 Putting mini courses in small areas allows for creativity — such as this ground hole at Mushroom Manor in Lancaster. “One of the reasons I wanted a course in my yard is because it’s the same thrill as big golf, but I don’t have to go anywhere,” Morgan said. Hobson Park in Lancaster — billed as the world’s first 18-hole public mini disc golf course, is one place to start. At the beginning of the 18 is a box that contains minis people can use for the round. The course is easy to follow and at the end — at hole 18 — is another box where one can deposit the disc they borrowed. Three other courses — Beaver Creek Mini DGC, Mini DGC at Mushroom Manor, and Starry Stompin’ Grounds Mini DGC — are all listed at DGCourseReview.com. The others, well, getting to know a few people or making a couple of calls or sending e-mails to some of the regulars in the area might help you get on some of the other private courses. Beaver Creek is Brooks’ course and is quite spread out on his property in Strasburg. It’s 32 holes and gives you the feel of a big disc golf course in that it utilizes a lot of land, terrain, tricky shots and scenery. Creativy is very important on a mini course. 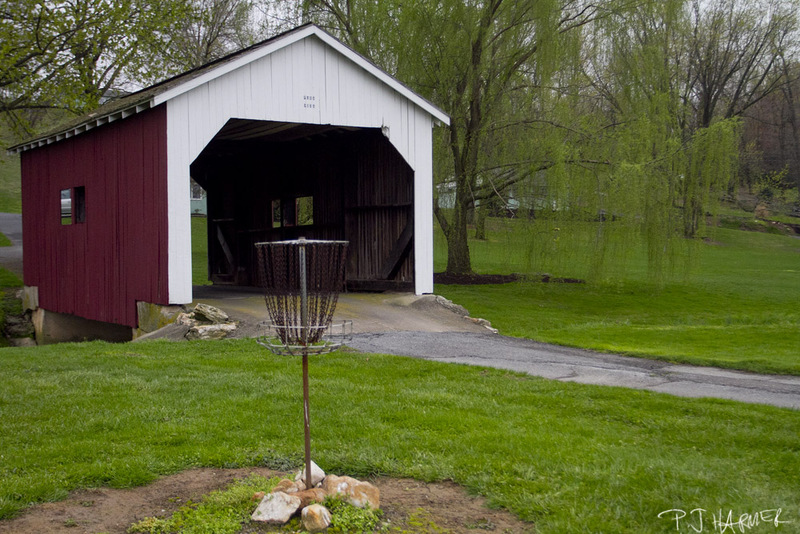 For this hole, one has to come through the covered bridge as a mando. During a round, you’ll have the chance to see Amish buggies traveling by and experience a peaceful setting. And one of the holes makes you go through a covered bridge that’s on the property — something that seems quite unique to this mini course. There’s teeing off from a dock over a small pond, hills to throw up and down, woods to go in and out of and streams to cross and plan shots to get around. It’s challenging in its own right — with or without a big disc. There’s real water, too, as a creek flows at the back of his yard and it can come into play on a few holes. Starry Stompin’ Grounds in Conestoga is owned by Dave Starry (MDGF .0003), who has an 11-hole course. He said his plans are to expand the course one hole per year until he makes it 18. As with Mushroom Manor, Starry Stompin’ Grounds is tucked in a residential area. His fairways are mowed in a delightful way and he has interesting holes, which includes having to throw over a pool. There’s also terrain, woods and tight shots, which makes the course an interesting play. Then there are hidden gems — ones that aren’t quite open to the public, but if you can get to know some of these players, you might have the chance to play a few others. One of the other interesting courses is Headdie Hills, a nine-hole course that is jammed into a well-used front and back yard. There are tight shots and other shots that require you to be mindful of a small stream. There are some ground holes, as well, which make things interesting. 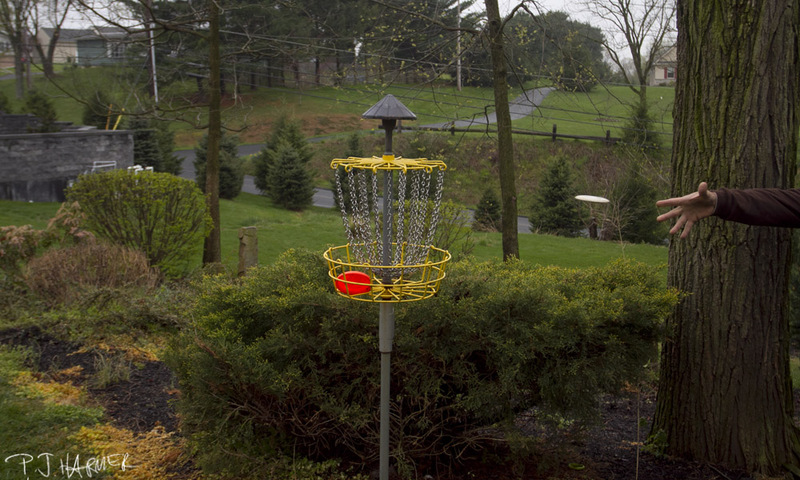 Is Lancaster County the Mecca of mini disc golf? Brooks shrugs off that notion, however, and said it’s because they happened to be in the Lancaster area. “We had a core crew of people who love it and took it to the next level,” Brooks said. “It’s because we live here. I planted a good seed and it’s grown. Still, building the game elsewhere is a slow process. That means the future of the game could happen anywhere in almost any situation. Morgan noted mini disc golf could find a home in places such as carnivals, fairs, small parks or anywhere else. The opportunities are endless. P.J. Harmer is the lead blogger for Rattling Chains. If you have any comments, questions, thoughts, ideas or anything else, feel free to e-mail me and the crew at: pj@rattlingchains.com. Don’t forget to follow us on Twitter and like us on Facebook! ← Cardio Disc Golf: A new fitness trend to sweep the nation? I had no idea there was an area that has taken to mini golf like this. Makes me want to find a place in my area to install such a kid friendly version of our favorite sport. Great write up. If you want to visit the “Mecca” of Mini Disc Golf, feel free to contact me. If you are interested in putting in your OWN course, I can help with any questions on the subject. Great Story, Thanks to the guys who showed an interest, and came away with a new adiction. What a Great, Fun experience that will be remembered. Would love to visit the Amish , read a lot if books about their life . Now with this disc golf it’s amazing what they do. Never heard if it until last year. Stood and watched and was amazed how was played . Thanks for sharing this .